In Front of The Wall! That pink & roses shirt is the new "uniform" for Nana Sadie Rose - and my Big Sis's brain-storm. What a wonderful job she did arranging the 3 shows we had this weekend - BIG Thank you's and (((HUGS))) to both of my sisters! Three skeins of Koigu in a lovely springy colorway - and I have no idea what to use it for (ideas, anyone? 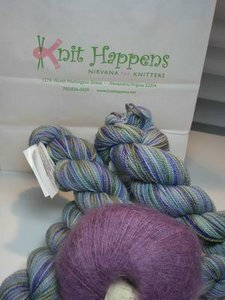 )...and my first skein of Rowan's Kidsilk Haze in Dewberry for Branching Out. Two years ago today I put down my cigarettes for the last time. Today, 24 months later, I'm still too heavy, I don't exercise as I should, and I've got an additional diagnosis I didn't have when I started this path...nonetheless, quitting smoking was the single best thing I've ever done in my life. I won't get philosophical here - that's for Nana Sadie's Place - but if you're struggling with this issue, check out The Q. I owe my quit to their 24-7 online support! Nana Sadie Rose Yahoo Newsletter & NoVA Parties! Just a taste of some of the delights you'll see at the NoVA parties next weekend...please be sure to email me if you're going to be in the Alexandria VA area February 24 & 25 and would like to attend? We'll make sure you get an invitation! Since I know many of you are Nana Sadie Rose's good customers, I wanted to mention here that the entire site has been redesigned with an emphasis on ease of use. I think you'll be pleased. So stop by Nana Sadie Rose and see our new home! Ah what fun...stay tuned...Nana Sadie Rose just keeps having bright ideas! The Meezer thinks this chart for the Highland Triangle Shawl is a bit confusing, even with my handwritten notes! 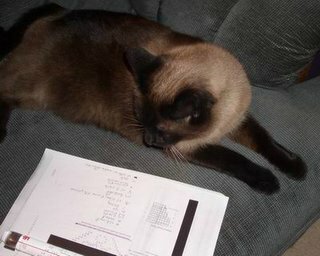 I caught her trying to decypher it - she's such a Ms. Smarty Pants! 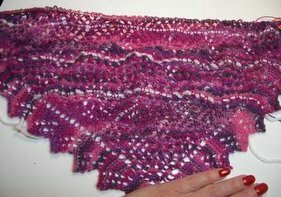 From Folk Shawls by Cheryl Oberle. 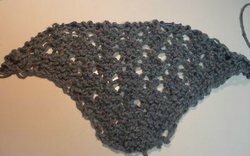 I've finally cast on for the KAL! Here at row 34 of the first repeat (the color is a bit lighter than it shows here) - it's not much, but I simply had to spend a few minutes on the knitting I craved instead of work! S tudent, perpetually, now of lessons in crafts over vocational training. A ssertive for other's rights, tho' not always for my own. L ifelong learner as a generalist not a specialist. L oyal and loving to a fault, long beyond a reasonable stopping point. E ducator, once upon a lifetime ago. E xtrovert to some, tho' to seem so is a daily struggle for this introverted me. I won't tag someone for this one...if you read this and wish to try it, consider yourself tagged? A few months ago, the nation was stunned by the power and destruction of a Hurricane called Katrina. 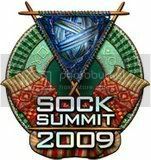 The Yahoo Groups knitting community began what now can only be described as a herculean effort to knit facecloths to distribute to the survivors of that hurricane and the others that followed in the Season of 2005. I am awed by the dedication of the members of the Cloths for Katrina group. That so few people could create so many simple cloths is humbling. I know in my heart they were greatly appreciated. But it's 2006. While things in the Gulf are not back to normal by any stretch of the imagination, the desperate, immediate need has passed. It was getting harder and harder for the owners of the KAL to find shelters to send cloths to, as the victims of the storm relocated or returned to their lives and the shelters closed. And so the owners of Cloths for Katrina decided it was time to poll the group and decide upon the future for it. That poll has ended. The results of it indicated that the members wanted to continue to make cloths, to provide at some level, either local or national, the same sort of assistance. So a new group has been formed. Cloths for Katrina will cease to exist as of Friday, February 17, 2006. No new members are being accepted at this time. Please, if you are a member of Cloths for Katrina, make sure you click on the following link or the button over there, and join us in our continued effort to make Cloths For Crisis. 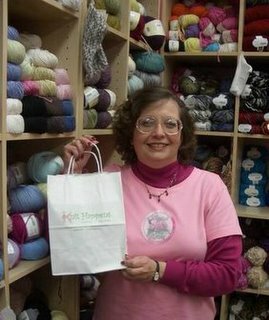 If you were not a member of Cloths for Katrina, but would like to join us now, please click on that button over there, and pick up your needles to make cloths! You may distribute them in your local community or at the links available for continued hurricane relief efforts in the Gulf, or you may take a breather and join us when the next hurricane hits (as unfortunately, we all know it will...). If the last is your choice, please consider spending a few moments each month creating a small stash (or large one!) of cloths that you will have available at a moment's notice? So we don't have the lag time to get up and running when the next major crisis hits? 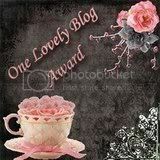 Thank you all, and my very warmest (((hugs)))! When Do You Find the Time to Knit? I try to get to work about 15-30 minutes ahead to sit quietly and knit a bit at that point. I also take my lunch to work and knit on my lunch break. 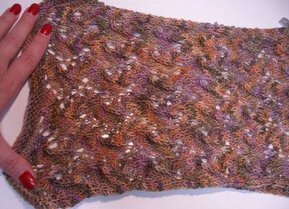 I carry knitting with me almost everywhere, so if I have a wait of any length of time, the needles are in my hands, and I will usually knit at night before I go to bed. Some mornings, I can get a few rows of simple stuff (dishcloths, fun fur scarves) done while I'm drinking my coffee and watching the news and weather. But with two businesses and a full-time job, it's a challenge, especially to complete a big project. Finally Some Knitting Content? You Bet! 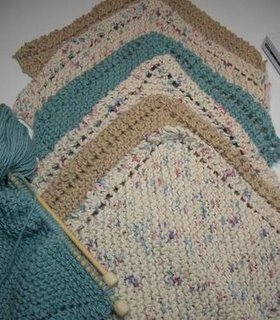 It's been awhile, but that doesn't mean that all of my energies are being poured into Nana Sadie Rose - after all, there's KNITTIN' to be done! Moving on to lace...lace...lace...you'll see in the middle photo below the Traveling Vines Scarf THIS time made with Wendy's birthday yarn (it's turning out much better than the partially acrylic sock yarn did). And yes, Wendy, I love, love, love Koigu! Thank you, again! I have the yarn for the Highland Triangle Shawl we're supposed to be knitting in Folkshawls Yahoo Group. But it's not on the needles - yet. Progress on Diamond Fantasy Shawl! Traveling Vines & Wendy's Koigu! Dishcloths? Nope - Grooming Cloths! I don't have any other reason to forego the Knitting Olympics my idol started, than that I'm too snowed under with Nana Sadie Rose activities, but I saw this beautifully written very good advice for anyone who knits and said, we'll just have to write a short entry to spread the word around! Do, if you have any repetitive stress problems, practice these cautionary steps? It's also my favorite herb for cooking - love rosemary chicken! The tote is 19 inches wide, 11.5 inches high, & 5 inches deep, with 7 inner pockets. The 2 pockets on the side will hold notepads, spiral notebooks, lesson planners! The center section is plenty large enough to hold a laptop. 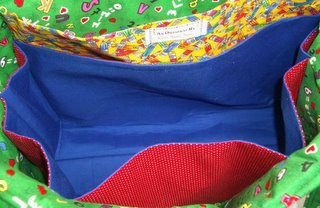 The shoulder straps drop 14 inches below your shoulders for a comfortable fit... Email me if you'd like me to make one for you! Sadie Teacher's Tote inside, unloaded! Sadie Teacher's Tote Can Hold a Lot! 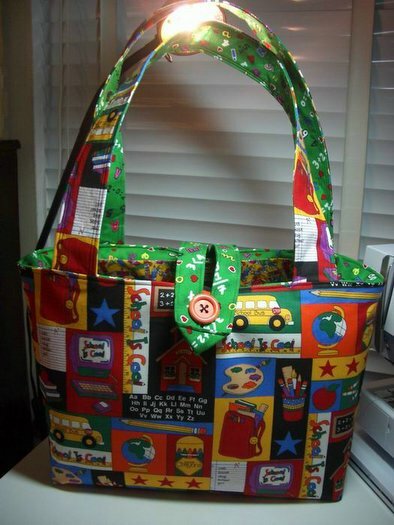 The Sadie Teacher's Tote - loaded and there's STILL room for more! In advance of the Nana Sadie Rose parties that will be held February 24-25 in Alexandria, VA, my sister (the hostess) asked me to finish up the design of the Sadie Teacher Bag. Well...It's HERE! Head on over to my website and take a look. This bag is MUCH bigger than any previous design: a very large 19 inches wide, 11.5 inches tall, and 5 inches deep, with an extra long loop closure so the bag can accomodate binders, books, papers to grade - even a laptop - in the large center section. 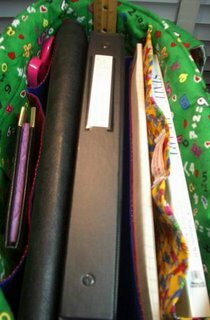 There are two staggered pockets that will hold file folders, spiral notebooks or lesson planners, then two sizes of 4 smaller pockets around the bag for smaller books or supplies and sundries. The shoulder straps drop 14 inches below your shoulder. The sample bag on Nana Sadie Rose is done in a cute school fabric, but remember, YOU DECIDE on the outside fabric of your bag, as this bag is only available by custom order. You just might prefer a solid colored bag, with the cool print on the inside! If you're an urban professional, you might prefer a black, brown, navy or olive bag - that is certainly an available option...Just let me know. 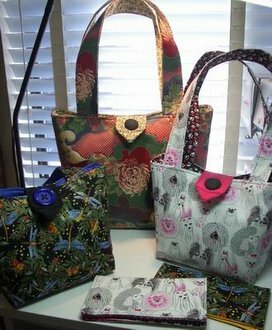 As with any bag on the site during the month of February, if you choose a heart-themed fabric 5% of the retail price will be donated to WomenHeart to further their efforts of education, advocacy, and support for women with heart disease.